The purpose of this study is to determine if laparoscopic plication of a gastrojejunostomy with endoscopic guidanceis a feasible surgical option for the gastric bypass patient who has regained weight due to a dilated gastric stoma. After obtaining IACUC approval, a porcine model was used to simulate a gastric bypass with an enlarged gastrojejunostomy. The animals underwent a 60 mm linear stapled gastrojejunostomy, and subsequently had endoscopic visualization to evaluate the size of the gastrojejunostomy. A laparoscopic plication of the gastrojejunostomy was then performed using 2-0 Ethibond suture on the medial, lateral and anterior surface of the anastomosis. These sutures were placed submucosally on the gastric side of the anastomosis to avoid entering the lumen. The resulting anastomosis was evaluated endoscopically and air pressure tested using insufflated air in the stomach. The procedure was performed in cadaveric and live porcine models a total of 4 times. An average reduction in the area of the gastrojejunostomy lumen after placement of the plication sutures was 68.1% with a range from 43.9-84.8% reduction. There were no leaks upon insufflation of the gastric pouch, as the sutures were not placed intra-luminally. Figure 1:Endoscopic images (A – C) show the progressive reduction in size of a gastrojejunostomy lumen after placement of successive laparoscopic plication sutures. 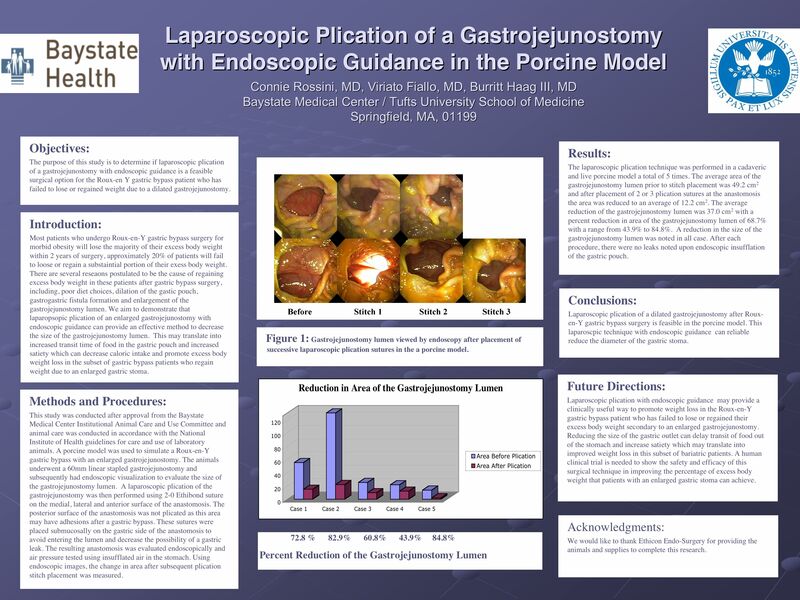 Laparoscopic plication with endoscopic guidance of a dilated gastrojejunostomy after gastric bypass surgery is feasible in the porcine model. This procedure can reliable reduce the diameter of the gastric stoma and may provide a clinically useful way to promote weight loss in the gastric bypass patient who has regained weight secondary to an enlarged gastrojejunostomy.